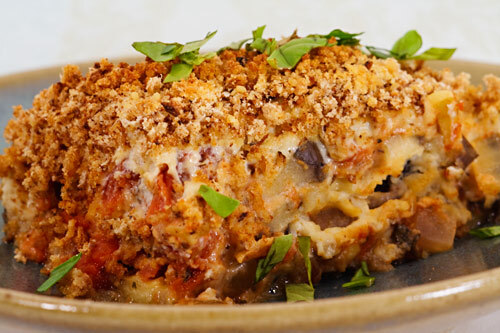 I haven’t had eggplant parmesan in so many years that I’ve literally forgotten what it tastes like, so I can’t promise that this tastes like the “real thing,” but I can promise that it is delicious–rich and creamy inside and a little crunchy outside. The method I used is taken from a recipe by Bryanna Clark Grogan that I found online. Actually, I messed up the layering a little, but I think I like the results. When putting the dish together, I forgot to add the second layer of bread crumbs and wound up putting them on top, where they browned nicely and got a little crunchy. Try it my mistaken way or put most of the bread crumbs inside and save a few for the top. If you don’t have vegan parmesan, feel free to leave it off. The cheese sauce provides most of the flavor anyway. Or instead of parmesan, try finely ground almonds; just put a quarter cup of almonds in your food processor and pulse to finely chop. Salt the eggplant slices and put them in a colander to drain. Prepare the tomato sauce by sautéing the onion in a non-stick saucepan until it becomes translucent (you may use a little water if you like). Add the garlic and sauté for one more minute. Add the remaining tomato sauce ingredients, and cook for 15-20 minutes. Prepare the cheese sauce: Place all ingredients in a blender and blend until completely smooth. Blend again right before using to make sure that the ingredients haven’t separated. Rinse the eggplant slices and pat them dry with paper towels. Line a baking sheet with parchment paper and place the slices on it (you may have to do this in two batches). Place under the broiler. Watch carefully, and remove when the slices start to brown, about 3 minutes. Assemble the casserole: Preheat the oven to 350. Spray or wipe an 8×8-inch non-metal baking dish with a small bit of olive oil. Place half of the eggplant slices on the bottom of the dish, edges overlapping. Sprinkle with half the breadcrumbs. Spoon half the tomato sauce and pour half the cheese sauce over the breadcrumbs and sprinkle lightly with soy parmesan. Repeat the process with the remaining ingredients (reserving some bread crumbs for on top, as mentioned above). Bake uncovered for about 20 minutes, until slightly browned on top. Sprinkle with fresh basil just before serving. Thanks to Bryanna for helping me figure out how to put together a dish I haven’t eaten in so long! I don’t like cooking with soy so I substituted 1 1/2 cups garbanzo beans for the tofu and soy milk. I used an extra teaspoon onion powder instead of the nutritional yeast. Used natural peanut butter instead of tahini and doubled the ground almonds. Tasted fantastic! I also tried it with and without added olive oil for sauteing and cooking the eggplant, it tasted good both ways. I skipped the salting and rinsing of the eggplant. Great recipe, thanks! I’ve been vegan for a year now and Eggplant parm was my favorite dish, I do not miss alot of foods but I do crave this one. So I gave this recipe a try the other day and it is AMAZING. I can’t thank you enough for the recipe. Really enjoyed it. can’t see a direct contact link so am posting this here. I was searching for vegan parmesan recipes and found this link which to me is y our recipe! http://www.tastebook.com/recipes/912103-Vegan-Eggplant-Parmesan – in case you wanted to know or maybe already do know :). Hi! I’ve just started using the recipe box feature. However, I only see the first 4 recipes I added when I’m in my recipe box. I don’t see a way to go to another page, only to “clear all recipes”. Thinking something went wrong when I tried to add the other recipes, I’ve found them again (like this vegan eggplant parmesan, one of my favorites) and it asks me if I want to remove it from my recipe box, so it should already be in there. If it’s in my recipe box, why can’t I see it when I’m in there? What am I doing wrong? This sounds like a glitch in the program–you’re not doing anything wrong. See if clicking “remove from recipe box” and then “add to recipe box” makes any difference. Sometimes these computer things just don’t play well together, so there may be a conflict between your computer settings and the software that runs the recipe box. Oh, one more thing. Make sure you’re logged in (assuming you have a user account). This was a mega-hit with all five of us tonight! I subbed cannellini beans for the tofu and used So Delicious coconut milk. Oh, and doubled the recipe for my hungry crew; it fit nicely in a 9 x 13 pan. Thanks as always, Susan! Made this one too! Very good and will definitely make it again! Being an Italian and raised eating foods such as eggplant parm I will say it wasn’t quite what mom put on the table but enjoyable none the less! Susan, have you ever considered pitching a show The Food Network? They sure could use a vegan cooking show and so far your recipes are simply amazing! I have never been a fan of Eggplant, but I tried your recipe last night and it was WONDERFUL! My husband and I had to put it away before we ate the entire pan. I am very new to the Vegan Diet and I like that your recipes are simple yet filling. One of my concerns is always feeling hungry but both of us left the dinner table very satisfied! I just made this dish and it’s now baking in the oven! It smells delicious…I am sooo happy I am a vegan! Cooking this in my oven right now! It smells so very very good 🙂 I had to replace the 2 tbsp. cashew butter or tahini with raw (not roasted) organic cashews. I am using my Vitamix so I thought it would be okay! Also replaced the tomato sauce with 365’s Fat Free Pasta Sauce from Whole Foods. I will comment again after I get to taste it! Cannot wait! I really loved this recipe. I also think the tomato sauce is fantastic to have with a simple pasta dish. Thank you. This is a keeper! love this, the second time I made it I tried using crushed up tortilla chips instead of bread crumbs to make it gluten free, and now I’ve turned into this casserole dish I make all the time, by also adding zucchini and bell peppers to the vegetable layers. I use regular firm tofu in the cheese sauce, and ground up cashews for the parmesan cheese. Sometimes I add chipotle and other chili powders to give it more of a spicy mexican flavor. I made this last night for dinner and it was delicious! I made a few substitutions and it came out great. Thanks for the recipe! We loved this recipe! If I could find this kind of delicious foods in restaurants it would be a snap to eat plant-based all the time. The cheese sauce was delicious, as was the marinara, in their own right. The combo was ultimate comfort food. I would it longer than the recipe suggested until the cheese-sauce set up. Will make this again! I’ve never had good luck with cooking eggplant, but I went ahead and tried this – it turned out awesome!! Thanks for the great recipe! I made this tonight and thought it was good. My only problem is the question of whether to peel the eggplant or not. I don’t normally peel eggplant, but the skin seemed to be an issue for me in this recipe. I’m wondering if I did something wrong or if I but I just messed up by not peeling it. Your thoughts would be appreciated! And thanks for coming up with a great vegan alternative! No, peeling is not required. In fact, I made eggplant parm loads of times before becoming vegan and never peeled the eggplant once (and actually have never had it peeled in this dish). And thanks, Susan! Very, very good. I sub’d cannellini beans and coconut milk for the tofu and soy milk, respectively (both what I had on hand). Also, I used 1/4 cup of cashews for the cashew butter. It turned out splendid. Looks great! I have both soft and firm silken tofu in my cupboard but not extra-firm, it’s not at my grocery stores. Sounds like a good thing to have for this kind of recipe, though, but I’d be interested to know what other kind of tofu would be the best substitute. I might try it with the firm silken tofu and omit the soy milk to make the recipe a little firmer. The firm silken should work fine without any changes. I use firm and extra-firm interchangeably in all recipes. My daughter’s only complaint was, “What did you put in this. It tastes like cheese!” I think that means it’s a repeat. I made the eggplant for dinner the other night. It didn’t taste like eggplant Parmesan but my hubby and I really enjoyed it. Will definitely make again. Thanks for another great recipe! I am making this dish for the third time tonight. It is my favourite vegan supper by far! My vegetarian husband loves it too:) I followed the recipe exactly as is and it is perfect. Just made this twice in two days! I modified slightly, adding firm tofu, broccoli, red peppers, and kalamata olives to the tomato sauce. Divine! The eggplant was still a little uncooked, though — maybe I need to broil it a bit longer next time. I’m a huge fan of your site! This is hands down the best Italian casserole I’ve ever had! Usually vegan attempts at cheese are not good but the way this tofu cooks up it tastes just like ricotta. This was soooo good! Thanks! Thankyou! This is unbelievably good. I used almond milk instead of soya and ‘cashew parmesan’ and cooked it for longer, probably because my sauces weren’t as thick as yours but it was amazing nonetheless! Could this be assembled ahead of time and kept in the fridge until baking? I made this (a few alterations in recipe) for a vegan option at a lunch I hosted. I am not vegie or vegan but am absolutely in love with this recipe that with the left over ingredients I made it again all for myself to enjoy for my work lunches! I also added some baby spinach to each layer! Wow, Susan, this eggplant casserole rocks!! I had 4 roma plum tomatoes that I had to do something with so I used them in place of the canned tomatoes. Sautéed mushrooms in the beginning with the onion and garlic. So good that I had to refrain myself from licking my plate clean!!!!!! Next time I’m definitely doubling the recipe!! This is now my go to recipe for eggplant parma. I have served it to my non-vegan friends who absolutely love it. My only 8×8 baking dish is metal. Would that work? Susan, like others have commented, this is really delicious. My only wish is that I had read all of the comments before making it because my eggplant never got 100% done even after an additional 10-15 minutes at 350 degrees and another half hour at 400 degrees. Have you considered changing the recipe directions so new folks don’t struggle with this? Should the broiling directions say to broil on both side until the eggplant is tender? I wonder if I could use almond butter instead of cashew butter. I also wonder if I could make cashew butter in my food processor. I have to say that I love your blog and your recipes. I use them all the time. You are one of my “go to” websites when I am looking for something new and different to try. I am going to make this for lunch today! I am baking my whole wheat rolls for hubby and the oven will be on anyway. It is 100+ here in Texas! I’m so happy to hear that, Judi (not the part about the temp, LOL. It’s in the mid 90’s here in Jackson, but the humidity makes it feel worse, so I feel your pain.). Almond butter would probably be your best option. You can make cashew butter, but only if you have a Vitamix or high speed blender. It won’t get smooth enough in most food processors. Hope you enjoy it! Thanks so much for a fantastic recipe. Made this a few weeks ago and I plan on making it again. Just purchased some ore eggplant. Just deliciousness goodness all around. 10 out of. 10! Thank you, Becky! I feel the same way about extra steps! I’ve been plant based for8 months now, and I’m always looking for new recipes. My husband and I both love eggplant,so I will definitely try this recipe!! Made it today and it was gone at lunch time (thanks to 3 hungry teenagers). It tasted good, but unlike eggplant parmesan. Please call it what it is: eggplant with tomato sauce, bread crumbs, nutrional yeast & tofu cream. Yes not a very entertaining name ! Wow! This looks absolutely scrumptious, but—how to make the cheese sauce without soy? I am recently vegan and was looking for a good recipe to go with the baby egplants I picked up. This was fantastic! Now that I have made it once, I think it would be fairly quick and easy to repeat. I used Dave’s killer bread for the bread crumbs and put some on top. The meal looked gorgeous and tasted better. My family gobbled it. My kids are 5, 7, and 9. The 9 year old said he really liked it. The 7 year old ate it without complaint and the 5 year old whined a bit at first, but did eat it without too much drama. This one is going in the recipe book. I live alone…Can this be frozen? It was really good. I was a little concerned about the consistency of the cheese sauce (seemed much thinner than i was expecting it to be), especially after reading the reviews from people who said it was a runny gloppy mess. But in the baking process it thickened nicely. Good flavors. /will have it for lunch tomorrow & I did freeze the other half of it for another time.